San Francisco's Acephalix began as a hybrid of crust punk and death metal. Given that a couple of their earliest releases came out on Prank, it's natural a little punk would shine through the murk. Through a pair of tapes released in 2010 and 2011, and packaged together as Interminable Night out on vinyl on Agipunk, the death-metal influence became more prevalent. D-beats were still a component of the band's machinery, but the riffing began to resemble Grave and other stalwarts of 1990s Swedish death metal. 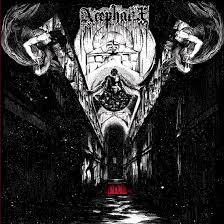 On Deathless Master, the crust presence has all but departed, and Acephalix are now committed to death metal. Riffs are still of the Swedish persuasion, but Acephalix also work in grooves that they can call their own. LIMITED EDITION comes in 100 copies on green/black marbled vinyl.